My first sew for the year was a slow one. 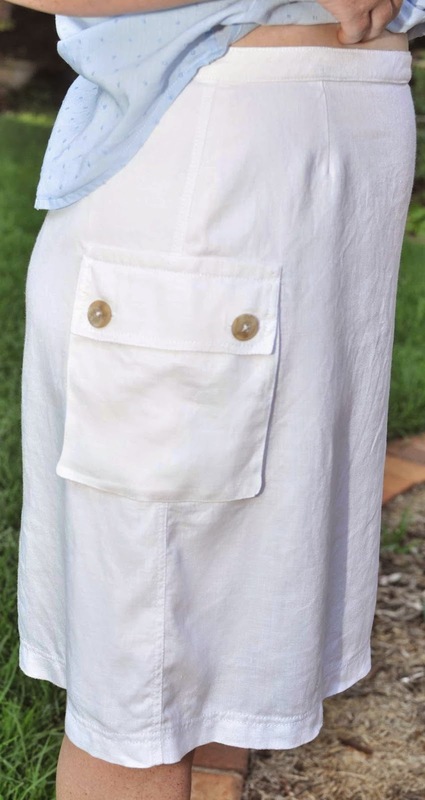 A lovely white linen skirt with top stitching detail and cargo pockets. I don't know why but I do love top stitching... soothing...mmm. I used a mash-up of pattern 15 with pattern 4. I took all the main details of the 15 Debra Linen skirt..
but used the darts from 4 Zaffiro silk skirt, instead of the gathers. I also added a lining (pattern 4) but used the walking vent from view 15. I loved sewing the cargo pockets. First time I have tried them and they were interesting to make. It took a little while as I was following the written Ottobre instructions, but I checked some tutorials on the web and it fell into place. I did use buttons to hold the flap down rather than velcro as per the pattern. I saw natural coloured buttons used on a similar detail on a RTW white linen skirt and thought it looked smart but still casual. The fabric is from Spotlight and was called linen suiting. Being white I felt it needed lining so used a rayon/poly blend with a nice weight also from Spotties. I am pretty happy with this skirt. I wanted a cool, casual style skirt and that is what I have achieved. 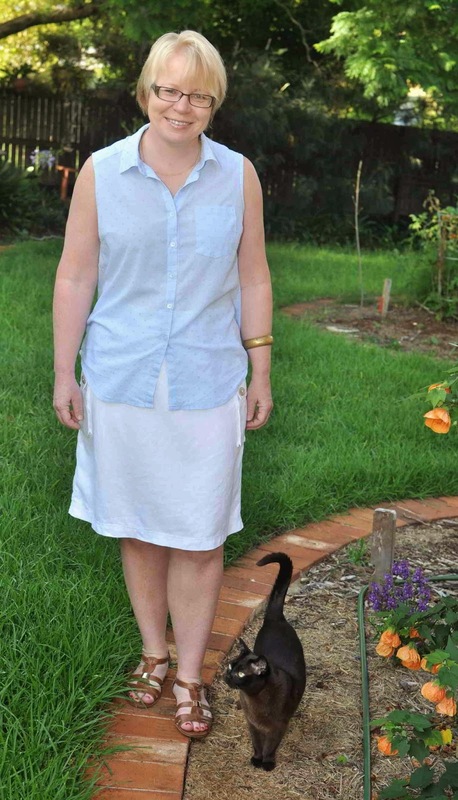 Even with the lining the skirt coped well on a visit to Brisbane in the middle of a heat wave. The top for those interested is also from Ottobre (02-2013-3) and is detailed here. I really like the white skirt with the blue skirt... cool and pretty I think. The review for the skirt is here but doesn't detail much more than I have said in this post. Well from me and my favorite photo bomber... Ciao kittens! I love white linen with light blue... looks cool and really in our heat lately, just what's needed. Perfect skirt for summer, you will get a lot of wear out of it. These look amazing Sue. Both pieces certainly work together and they're your colours too. I must look up that skirt pattern. Top stitching is very rewarding.